The question of how many frangipani (or plumeria) species there are is actually quite a contentious one. Some gardening experts say there are only 2, and all others are subspecies or hybrids. Others say 3, 4 or more. 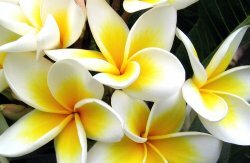 As this article is for the everyday gardener to help them identify what type of frangipani they have seen, not for the scientist or expert, I'll describe the four main types of frangipani or plumeria that you are likely to find in your garden or local nurseries. The most common frangipani is the Plumeria Rubra. Rubra come in many colours, from white to cream to yellow, even oranges, pinks (both pale and hot pink), reds and even deep cerise. They also come in multiple colours (such as pink, apricot and yellow in the one flower). And Rubra has the most fragrant flowers! The flowers themselves have medium sized, oval shaped petals (always 5 of them) which are joined tightly at the base. The flower starts as a long tube, then the petals slowly unwrap and open to form the frangipani flower we all know and love. 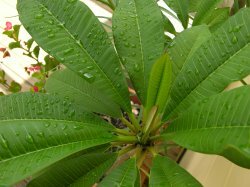 The leaves from a Plumeria Rubra are long and oval and have quite a pointed end. The leaves are quick to drop off as the winter coolness approaches. A Plumeria Rubra can grow to 5m tall and almost as wide. One of the most popular frangipanis is the Plumeria Obtusa, also known as a Singapore White or Singapore Pink. As the name suggests, these flowers only come in shades of pink and white, although I am sure there are frangipani fanciers somewhere working on some new cultivars! The petals on a Plumeria Obtusa flower are rounder than those of Plumeria Rubra, and they tend to bend over backwards at the very tips. The Plumeria Obtusa is also known as the evergreen frangipani, as, in the right climate, they will keep their leaves all year round. The leaves are a glossy dark green, long and oval. The ends of the leaves, however, are more rounded than those of the Plumeria Rubra. Plumeria Obtusa are smaller plants than Plumeria Rubra and grow only to the size of a medium to large shrub (depending on your climate). If you are familiar with Plumeria Rubra and Plumeria Obtusa, your first glance at the leaves on a Plumeria Stenophylla will have you totally confused! Plumeria Stenophylla leaves are very long and thin, not unlike an oleander. The flower petals of a Plumeria Stenophylla are also very long and thin, and have a wider gap between each petal than a Plumeria Rubra. As with Plumeria Obtusa, they are generally only available in shades of white or cream, but it's probably only a matter of time before more vibrant colours become available. 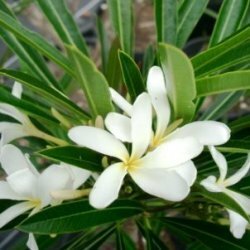 Plumeria Stenophylla is a well shaped bushy shrub with a long lasting flower display. It grows to approximately 2.5m. Plumeria Pudica are very easy to grow, and bloom heavily for a long time. Like Plumeria Obtusa, they can be evergreen in warmer locations. Plumeria Pudica leaves are dark green and a unique spoon shape (long and thin, and then widen out towards the tip, like the shape of a soup spoon). The flower petals of a Plumeria Pudica are similar to those of Plumeria Obtusa. They are more rounded than Plumeria Rubra, creating a more rounded flower, however they do not arch backwards like the Obtusa. Again, they are generally only available in shades of white or cream, however a new pink cultivar has just been released. Plumeria Pudica is a medium sized tree with profuse branching. 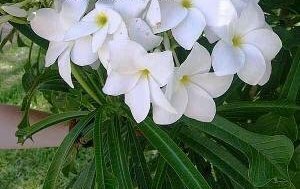 If the plumeria you have seen or heard of is not listed here, it may be one of the more popular hybrids such as Plumeria Stenopetala, Plumeria Tuberculata or Plumeria Caracasana. Plumeria Stenopetala is actually a hybrid cross between a Plumeria Stenophylla and an unknown plumeria. It is a small compact plant, usually less than 2m tall, with deciduous long narrow leaves and long petalled flowers (very similar to the Stenophylla). Plumeria Tuberculata is a shrubby, evergreen plumeria with long rounded leaves and very large, very thin petalled flowers (thinner than Stenophylla and Stenopetala). Plumeria Caracasana is a large tree with spoon shaped leaves (similar to Pudica) with very large flowers. Like Obtusa flowers, the petals of Caracasana bend over backwards near the tip, though not to the same extent. Also, the petals are thinner than either Obtusa or Pudica, and are much more the same shape as those of a Rubra. Well, hopefully this little guide will help you identify what type of frangipani you have in your garden, or have spied in a neighbour's garden. If not, feel free to drop me a line on our Contact Us page. Frangipani Body Mist in a handy pump spray. Available in our Toiletries range.